The combined Minden City Hall and Convention Center opened on Broadway Street in 1970. Minden is a small city in and the parish seat of Webster Parish in northwestern Louisiana, United States. It is located twenty-eight miles (45 km) east of Shreveport in Caddo Parish. The population has been relatively stable since 1960, when it was 12,786. Minden is 51.7 percent African American. Minden is the principal city of the Minden Micropolitan Statistical Area, which is part of the larger Shreveport-Bossier City-Minden Combined Statistical Area. 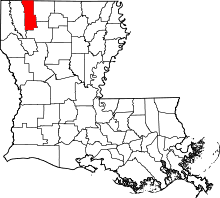 It is a regional trade center for the neighboring parishes of Bienville and Claiborne, from which Webster Parish was carved in 1871. Minden has possessed a United States post office since 1839. The current postal building, a 10,000-square-foot structure at 111 South Monroe Street, was completed under a $285,000 contract awarded in 1959 to McInnis Construction Company of Minden. The community has been served by a newspaper since the 1850s. The current publication, the Minden Press-Herald, is located on Gleason Street south of Broadway. The building was formerly used by a grocery store. The Press-Herald became a daily newspaper on July 18, 1966, but was earlier published as two weekly papers, the Minden Press on Mondays and the Minden Herald on Thursdays. For a time there was also the Webster Signal-Tribune and other publications. On October 15, 2012, an ordnance bunker at nearby Camp Minden exploded resulting in minor property damage. Camp Minden is the site of the former Louisiana Army Ammunition Plant, once the major area employer. In December 2012, police began the removal of 2,700 tons of explosives from Camp Minden, leading to evacuations in the nearby town of Doyline. In 1959, Minden was named the "Cleanest City in Louisiana." The Federal Building at 111 South Monroe Street in Minden has since 1959 housed the post office. From 1916 to 1959, the United States post office was located on Main Street in a building later occupied by a bank. It moved in 1959 to the Federal Building. Previous to 1916, the post office in Minden had been located in leased locations. Among the original settlers in the Minden area was Newitt Drew, a Welshman originally from Virginia, who built a gristmill and sawmill on Dorcheat Bayou in south Webster Parish in what became the since defunct Overton community. Minden itself was established in 1836 by Charles H. Veeder, a native of Schenectady, New York, who named it for the city of Minden in Germany. Veeder left Minden during the California Gold Rush and spent the rest of his life practicing law in Bakersfield, California. A year before Veeder arrived, a group from Phillipsburg (now Monaca), Pennsylvania, led by the Countess Leon, settled seven miles (11 km) northeast of Minden in what was then Claiborne Parish. For nearly four decades, this Germantown Colony operated on a communal basis. It was dispersed in 1871, when Webster Parish was severed from Claiborne Parish. The "Countess" moved to Hot Springs, Arkansas, where she died in 1881. One of three Utopian Society settlements in this area, the Germantown Colony was the most successful and lasted the longest, having peaked at fifty to sixty pioneers but usually with fewer than forty followers. The settlement had been planned by the countess’ husband, Bernhard Müller, known as the Count von Leon. He died of yellow fever on August 29, 1834, at Grand Ecore, four miles (6 km) from Natchitoches, before he reached Webster Parish. Leon and his followers attempted to build an earthly utopia, socialist in practice, while awaiting for the Second Coming of Christ. For his religious views, Leon had been exiled from Germany. He intended to plant the settlement in Webster Parish to coincide with the latitude of Jerusalem, 31 degrees, 47 minutes. The colonists worshiped under oak trees at the center of the colony. They supported themselves from farming, with a concentration on cotton. The settlement is preserved at the Germantown Colony and Museum. A second museum in Minden, the Dorcheat Historical Association Museum, named for Dorcheat Bayou, is located downtown at 116 Pearl Street near the post office. It preserves the cultural history of the city and parish from the 19th century. Statue of a Confederate soldier at the western end of Jacqueline Park in Minden near the point where Main and Broadway streets turn into the Shreveport Road. The caption concludes with "Lest We Forget" engraved twice. During the American Civil War, a large Confederate encampment, which housed some 15,000 soldiers was located east of Minden. At the time Minden was a supply depot for the troops. Some thirty Confederate soldiers who died in the Battle of Mansfield and another engagement at Pleasant Hill are buried in the historic Minden Cemetery located at Pine and Goodwill streets and Bayou Avenue. A modern cemetery, Gardens of Memory, opened in 1957 off the Lewisville Road north of Minden. In 1862, Confederate General Richard Taylor, son of Zachary Taylor, issued orders to round up deserters. According to the historian John D. Winters of Louisiana Tech University, near Minden were seen "many robust-looking men claiming to be 'discharged soldiers.'" General Taylor reported that a "'large number of persons liable to military service . . . , deserters, enrolled conscripts who have failed to report, between the ages of eighteen and thirty-five, are to be found throughout the state.' He ordered militia officers and parish sheriffs to arrest all men who could not prove legal exemption or absence from military service because of furlough or parole. Liberal rewards were offered for the apprehension of such men." Governor Henry Watkins Allen tried to make the state self-sufficient during the war. A factory for the manufacture of cotton and wool cards was erected at Minden and in full operation by the end of the war. In 1864–1865, divisions of General Camille Armand Jules Marie, Prince de Polignac, hero at Mansfield, and Maj. Gen. John H. Forney established winter quarters near Minden. On February 13, 1890, Minden recorded the state's all-time coldest temperature, −16 °F (−27 °C) degrees during the height of the Great Blizzard. Another −16 °F (−27 °C) reading was recorded in Minden on February 2, 1899. The humid subtropical climate, however, is usually mild in winter and mostly hot in summer. During the Great Depression, one of the two Minden banks failed. Five banks now exist, Minden Building and Loan, Capital One, Regions, Citizens, and Richland State. On May 1, 1933, a tornado destroyed some 20 percent of the residences in Minden. Thereafter, a fire destroyed many homes and much of the business district, including the large Goodwill Building, established in 1882 by Alfred Goodwill, which once housed the largest general store in Louisiana. During the national bank holiday of 1933, the funds of both Minden citizens and businesses were frozen, making recovery from the tornado and the fire more difficult. Later, a summer flood destroyed a third of the crops in the area. Because of these quadruple tragedies, 1933 has been called the "Year of Disaster" in Minden. Ben F. Turner, Sr. (1883–1934), was the Louisiana and Arkansas Railway express agent in Minden and the volunteer fire chief. During the 1933 fire, he sustained a heart attack and hence died the next year of cardiac failure. Oddly, Ben Turner's grandfather had died in 1835 while fighting a fire at a brush arbor meeting in Georgia. Ben Turner's son, Harold Martin "Happy" Turner (1911–1988), was a well-known boarding house, restaurant owner, and civic booster in Minden. John Cecil Jones was an honorably discharged veteran of World War II and a cousin of Albert Harris, Jr. A woman in rural Webster Parish complained that black men had trespassed on her property. O.H. Haynes, Jr., then a sheriff's deputy, questioned both Jones and Harris about the alleged crime. He released Harris to a mob in nearby Dixie Inn, Louisiana, who took the young man to a rural area where he was bound, covered, and beaten by several other men. Fearing for his son's life, Albert Harris, Sr. sent him out of the state after he returned home. Deputy Sheriff Haynes went to the house to retrieve Harris, Jr. Learning that Harris, Sr., had sent the son away, Haynes broke the senior Harris' jaw. Harris, Jr., was eventually delivered to Haynes' custody. The police arrested John Cecil Jones, the cousin and veteran, at his workplace in Cotton Valley. Both men were jailed, where they were tortured and beaten multiple times by Haynes and another deputy, Charles Edwards. On August 8, 1946, Haynes released both men to a white mob in front of the old jail. The mob took the men south of Minden, where they beat and tortured them, leaving them for dead. Jones died from the beatings and torture, but Harris, Jr. somehow survived. According to R. Harmon Drew, Sr., then the assistant district attorney for Bossier and Webster parishes, jail records had been manipulated. According to the FBI, Dr. Richardson tampered with and concealed evidence taken from the crime scene, including a mechanical pencil and a wristwatch. Whitfield Jack of Shreveport (brother of State Representative Wellborn Jack), Barry Booth, A. S. Drew, and Harmon Caldwell Drew were defense attorneys for Haynes, Edwards, and the other defendants. R. Harmon Drew was defense counsel for the Minden Police Chief, Benjamin Gary Gantt (died 1948). He was not indicted by the grand jury, although multiple witnesses' testified that various city police officers had escorted the mob vehicles to the Minden city limits. Newspaper writer Paul Corvin likened city police at the time to the Gestapo but did not write such accordingly out of fear for his life. Eugene H. Lowe, Jr., the American Legion post vice-commander, likened local law enforcement personnel to outlaws. His sentiments echoed those of the reporter Paul Corvin. Eventually, Harris, Jr., fled Louisiana. The NAACP and the FBI became involved in the case and seeking justice for Harris and Jones. The federal government indicted deputies Haynes and Edwards and four others, who were tried for violating the civil rights of Jones and Harris, Jr. Ultimately, an all-white jury did not convict any of the six defendants. Country singer Hank Williams, Sr., married Billie Jean Jones Eshliman in Minden on October 18, 1952. The next day, the couple repeated the vows in two separate public ceremonies. Less than three months later, Williams was dead. A judge ruled that the wedding was not legal because Billie Jean's divorce did not become final until eleven days after she had married Williams. Billie Jean later married Johnny Horton, another notable singer. Horton died in 1960 and is interred at Hill Crest Cemetery in Haughton in Bossier Parish. Minden has an elevation of 253 feet (77.1 m). According to the United States Census Bureau, the city has a total area of 12.0 square miles (31 km2), of which 11.9 square miles (31 km2) is land and 0.1 square miles (0.26 km2) (0.75%) is water. As of the census of 2000, there were 13,027 people, 5,166 households, and 3,430 families residing in the city. The population density was 1,095.2 people per square mile (423.0/km²). There were 5,795 housing units at an average density of 487.2 per square mile (188.2/km²). The racial makeup of the city was 46.34% White, 52.17% African American, 0.31% Native American, 0.27% Asian, 0.05% Pacific Islander, 0.21% from other races, and 0.65% from two or more races. Hispanic or Latino of any race were 0.61% of the population. Minden has numerous businesses and an active Chamber of Commerce, which maintains offices near the intersection of Broadway and the Sibley Road. Two former executive directors of the chamber were elected as mayor, Tom Colten in 1966 and Paul A. Brown in 1989. Minden was a stop on the former Louisiana and Arkansas Railway. The local depot, located where Main Street turns into the Shreveport Road, was constructed in 1923. By the 1950s, it was converted into a freezer locker plant, used primarily for the storage and sale of meat. The building was razed in the spring of 1982. The Webster Parish Courthouse, completed in the spring of 1953, is located west of its former location. The latter site was paved in the early 1970s to serve as a parking lot for the Minden City Hall/Civic Center. Governor Robert F. Kennon, a former resident and mayor of Minden from 1926 to 1928, spoke at the dedication ceremony. In February 2014, the Fibrebond Corporation, which builds concrete shelters, announced a $2.5 million capital expansion project which will revive an inactive container mill adjacent to the company's existing manufacturing site in Minden. The expansion will create 225 jobs, which will pay $3,000 gross per month. Some twenty-five additional jobs will also become available temporarily for the pending construction work at the site. Larry B. Hunter (1896–1971) and his wife, the former Gladys Powell (1899–1973), a native of Sibley, for more than fifty years operated the Coca-Cola Bottling Company of Minden, at 412 Pine Street. The company was founded by Larry Hunter's father, William S. Hunter, a native of New Orleans, as North Louisiana Bottling Works in 1901. The company did not acquire a franchise to bottle Coca-Cola until 1905. When William S. Hunter died in 1919, Larry Hunter, at the age of twenty-three, became head of the company. While soft drinks were bottled at the facility into the early 1980s, the former bottling plant is now only a distribution center. The present brick building, constructed in 1926, is the third building to serve as home to the company. It is located across from the Minden Cemetery. The Hunters subsidized the Minden Redbirds, a semi-professional baseball team. They also built a regulation sized baseball field for the team; established the former Hunter's Park, which included Minden's first public swimming pool, and Hunter's Playhouse that hosted weekly dances for area teenagers. These were the first public recreational facilities in Minden for young people. The playground and playhouse operated from 1940 to 1965. A memorial statue in commemoration of Larry and Gladys Hunter's gifts to the city of Minden is located outside the Coca-Cola facility at the corner of Pine and Goodwill streets in Minden. The Minden Redbirds played at Griffith Stadium. After 1900, a quarter horse racing track operated at the site of the future stadium, adjacent to the parish fairgrounds. B. F. Griffith, Sr. (1867-1960), the Webster Parish sheriff from 1900 to 1908, was also one of the founding members of the Webster Parish Fair Association. In 1947, he succeeded in getting the property transferred to the city, and the whole area became known as Griffith Park. Griffith's son, Benjamin, Jr. (1927-2014), was a leading civic figure in the community often called upon to address civic groups on local history or to answer reporters' questions. A staunch individualist, he was in his later years still involved in motorcycling and skydiving. In 1950, Gladys Hunter became the first woman to have been elected to the Webster Parish School Board, on which she served for two six-year terms. In honor of her legacy the company funds a scholarship to be awarded each year to a deserving graduate of Minden High School. A collection of Coca-Cola memorabilia is on display at the Dorcheat Historical Association Museum at 116 Pearl Street in Minden. Much of this material was assembled by Ben N. Hunter (1930-2015), one of the sons of Larry and Gladys Hunter, who was also instrumental in publishing the 1997 book, Memories of Hunter's. He was Hunter's chief executive officer for twenty-eight years prior to 2001 and the 1997 Minden "Man of the Year". In the mid-20th century, Minden had two film theaters and a third drive-in facility. To promote the film industry, in 1951, theater owners Edgar Beach Hands, Jr. (1905–1972), and Ruth Cobb Cheshire Lowe (1906–1991) hosted several film stars in a visit to the city. One was a future U.S. senator from California, George Murphy. Another was Robert Stack of the later ABC television series The Untouchables. Jesse White, best known for Maytag commercials, also visited. By the late 1970s, Minden had no theaters. Its last was the West Plaza Twin Cinema, a building still standing off the Homer Road. In the 21st century, several motion pictures have been filmed in the city and the surrounding areas of Webster Parish. Numerous cities and towns smaller than Minden still have maintained the demand for a theater. Though it has no theater, Minden is the city of license for CW affiliate KPXJ, Channel 21. Main building at new Northwest Louisiana Technical College campus off the Interstate 20 service road; groundbreaking was held on September 6, 2013, with Governor Bobby Jindal, among others, cutting the ribbon. The Webster Parish School Board maintains administrative offices at 1442 Sheppard Street. Minden High School, located just north of the downtown, completed major renovation in 2007. The original Minden High School located adjacent to the current campus dates to the turn of the 20th century. Northwest Louisiana Technical College, a vocational technical institution, was formerly located on Constable Street near the Webster Parish fairgrounds and Griffith Stadium, a baseball field, where the former Minden Redbirds semi-professional team played. Governor Earl Kemp Long had included a trade school for Webster Parish in his 1948 platform, and State Senator Drayton R. Boucher and State Representative C.W. Thompson set about getting the initial $175,000 in funding through the legislature. In the summer of 2013, Northwest Technical College was relocated to a new and expanded site on the Interstate 20 service road. State Senator Robert Adley, who represents Webster and Bossier parishes, successfully sponsored SB 204, which will provide $251.6 million in financing and construction for twenty-nine projects at various technical college campuses across the state, including the new Minden facility. Elementary schools in Minden include E. S. Richardson, J. L. Jones, and J. E. Harper schools. In a cost-cutting move, the board in 2011 closed William G. Stewart Elementary School (built 1949), and the structure was quickly razed thereafter, leaving behind only a vacant field on Middle Landing Street. The middle school, Webster Junior High School, is located on East Union Street at the site of the former historically black Webster High School, which closed in 1975, with desegregation into Minden High School. The previous junior high school, Theresa M. Lowe Junior High School located at 109 Clerk Street near the fairgrounds, was closed after desegregation and converted into an alternative school. Theresa Lowe (1907–1959), namesake of the former junior high school, graduated from Rayville High School in Rayville in Richland Parish in northeastern Louisiana and received her Bachelor of Science degree from Louisiana Tech University in Ruston. She taught seventh grade at the former Minden Junior High School and was a leader in the Louisiana Teachers Association, since renamed Louisiana Association of Educators. Two of her brothers practiced law together in Springhill. Charles McConnell was also the mayor of Springhill from 1954 to 1958, and Nathaniel Julius McConnell, Sr., was the city judge there from 1956 until 1986. The private academy known as the Glenbrook School, located on Country Club Circle off the Lewisville Road, began in 1970 within the First Baptist Church of Minden. The Louisiana Missionary Baptist Institute and Seminary, which offers bachelor's, master's, and doctor of theology degrees, is located off the Homer Road in east Minden. The theologically conservative institution was opened in 1952 by the then pastor L. L. Clover of Calvary Missionary Baptist Church, which is located adjacent to the seminary. The main branch of the Webster Parish Library is located on East and West Street in Minden in a newer structure which opened in 1996. The $3 million library project, which included renovation of the previous plant to the right of the new structure, was funded through a 20-year bond issue. In a 17 percent turnout in a special election held in October 1993, voters approved the bond issue, 2,600 to 957. Minden has long led the nation in per capita fundraising for St. Jude Children's Research Hospital in Memphis, Tennessee. From 1975 to 2015, city residents raised $13,923,763. Early in 2016, another $1,441,599 was raised through auction, a benefit run, and school fundraisers. In the first year of the auction, $10,000 was raised, but the amounts grew rapidly over the ensuing years. Annual records have frequently been toppled. Tom Colten (1922–2004) served from 1966 to 1974 as mayor. He later headed the Louisiana Department of Transportation and Development under three governors of both parties, Republican. John T. David (1897–1974), the mayor of Minden from 1946 to 1955, when he resigned after two misdemeanor convictions for bootlegging. He was thereafter elected to three terms on the Webster Parish Police Jury, Democrat. Rita Heard Days (born 1950), a resident of St. Louis, Missouri, is a former member of both houses of the Missouri State Legislature, Democrat. Everett Doerge (1935–1998) was an educator and member of the Louisiana House from 1991 to 1998. He was succeeded by his widow, Jean M. Doerge, also a former educator, a Democrat, and a native of Natchitoches Parish. She was reelected three times to the House. Everett Doerge won the post in the 1991 general election by defeating the Republican Eugene S. Eason of Springhill. Richard Cleveland Drew (1848–1919), District and circuit court judge, Democrat. Jerry Huckaby (born 1941), a 1959 Minden High School graduate, served in Congress from 1977 to 1993. He represented Louisiana's 5th congressional district, which did not include either Minden or Webster Parish, Democrat. John Willard "Jack" Montgomery, Sr., Minden attorney and state senator from 1968 to 1972, Democrat. Robert T. Tobin (1911–2007), a retired educator, served on an interim mayor of Minden in 1989, the first of thus far two African Americans to have held the position, Democrat. John T. Watkins (1854–1925), served in the United States House of Representatives from Louisiana's 4th congressional district, Democrat. Griffith Memorial Stadium on Constable Street is named for B. F. Griffith, Sr. (1867–1960), the Webster Parish sheriff from 1900 to 1908 who is considered the father of the Webster Parish Fair. The stadium hosts baseball games. Ken Beck (1935-2006), defensive tackle for the Green Bay Packers. Billy Joe Booth (1940–1972), after playing for Minden High School and Louisiana State University, joined the Ottawa Rough Riders of the Canadian Football League, having played from 1962 to 1970. He died in an airplane crash in Canada. He resided in Harvey, Louisiana. Larry C. Brewer (1948–2003), a 1966 graduate of Minden High School, played successfully for Louisiana Tech University in Ruston and joined the Atlanta Falcons after college graduation but was unable to meet the commitment because of an injury. Brewer became a certified public accountant and worked in hospital management until his death of a drowning accident while on a family vacation in Hawaii. He resided in Sand Springs, Oklahoma, near Tulsa. George Doherty (1920–1987) was a professional football player (right tackle) who coached Minden High School to two state championships in 1954 and 1956 and then coached at Louisiana Tech and Northwestern State University. Fred Haynes (1946–2006), a 1964 Minden High School graduate, became a champion college quarterback at LSU, where he was affectionately known as the "Littlest Tiger" because of his modest physical size. Charles T. "Charlie" Hennigan (born 1935), originally from Bienville Parish, graduated from Minden High School in 1953 and played for Northwestern State University in Natchitoches before joining the newly created Houston Oilers in 1960. David Allen Lee (born 1943) is a retired industrial executive in Bossier City in Bossier Parish who holds National Football League punting records during his tenure with the former Baltimore Colts from 1966 to 1978. Prior to his professional career, Lee played for Louisiana Tech. Jackie Moreland (1938–1971) was the first All-American basketball player for Minden High School. He thereafter played for the Louisiana Tech Bulldogs, the Detroit Pistons, and the former New Orleans Buccaneers. He died of cancer at thirty-three. Sammy Joe Odom (1941–2001) was an MHS and Northwestern State football star who played in the 1964 season for the Houston Oilers. He was later the administrator for the De Soto Parish Police Jury in Mansfield. Jimmy Upton (1949–2003) excelled in track and field at Minden High School and thereafter at the University of Louisiana at Monroe and was admitted to three halls of fame. Gene Austin (1900-1972) was a singer, sometimes called "the first crooner". Alan Bean (born 1932) U.S. astronaut lived in Minden as a child while his father was employed by the United States Soil Conservation Service. James Burton (born 1939), a popular guitarist who once performed with Ricky Nelson and Elvis Presley, was born in Dubberly, Louisiana and reared in Minden until he was ten years of age. Bill Carlisle (1908-2003), Country and folk singer/songwriter, lived in Minden in middle 1950s. Barbara Colley (born 1947) is a romance and mystery novelist in New Orleans who was reared in Minden. John Jones, an honorably discharged African American former United States Army corporal, was jailed in August 1946 under pretenses of trespassing. He was released and lynched by a civilian posse, having reportedly refused to give a war souvenir to a white person. Ben Earl Looney (1905–1981) was a painter born in the Yellow Pine community in south Webster Parish. He graduated from Minden High School in 1923 and taught art throughout the United States in a career from the 1920s until his death in Lafayette. Maggie Renfro (1895–2010), an Athens native and Minden resident, was at the time of her death the third oldest person living in the United States. Ada Jack Carver Snell (1890–1972) was a short story writer who specialized in the literature of the Cane River of Natchitoches Parish. David Snell (1921–1987) was a journalist and cartoonist for the defunct Life magazine. Stanley R. Tiner (born 1942), the executive editor of The Sun Herald in Biloxi-Gulfport, Mississippi, started his journalism career at the Minden Press-Herald in 1969–1970. The Sun Herald won the 2006 Pulitzer Prize for its Hurricane Katrina coverage. Robert O. Trout (1904–1995) was a Minden educator and school principal prior to 1947, when he joined the faculty of Louisiana Tech University as a sociologist. On January 9, 2012, MTV premiered the reality television show Caged, about mixed martial artists fighting to gain the means to leave Minden. First Baptist Church at 301 Pennsylvania Avenue; since 2009, Leland Crawford has served as the senior pastor; George Washington Baines, maternal great-grandfather of U.S. President Lyndon B. Johnson, was the founding pastor in the 19th century. Earlier located for decades at 609 Goodwill Street near the parish fairgrounds under the pastor T. W. Barnes, who served there in the pulpit from 1947 until his death in 2006, the First United Pentecostal Church now occupies new quarters at 612 Highway 531. Formerly downtown across from the courthouse, St. Paul Catholic Church is located at 410 Fincher Road. The main Webster Parish Library operates on East and West Street in Minden, with branches located throughout the parish. The Minden Community House is located at Victory Park in this facility completed in 1987 by the W-M Construction Company of Minden, after the previous contractor, Tarver Brothers of Shreveport, defaulted on the project. The previous community house building was razed. Attractive but small Academy Park in the Minden Historic District is the site of the former Minden Male Academy. The McDonald-Monk House, built in Victorian style in 1904 at the intersection of Lewisville Road and East and West Street in the Historic Residential District, was added in 1986 to the National Register of Historic Places. The house is named for its builder, the banker J. W. McDonald, and the educator Miriam Robinson Monk (1923–2006), who purchased it in 1968. Dorcheat Historical Association Museum at 116 Pearl Street near the post office sponsors monthly public lectures. One of the oldest continuous businesses in Minden is the Western Auto dealership operated downtown by John P. Collins and previously by his grandfather and mother. The former Holland Crawford Insurance agency clock has long been a mainstay of downtown Minden. The company was founded by Castle Overstreet Holland (1895–1981) and operated until 2012 by his son-in-law, Wayne Scott Crawford (1928–2014). Minden Medical Center, located downtown, ranks among the "Top 100" hospitals in the nation. This historic bell, a gift to the City of Minden by the family of James Anderson Powell, Sr. (1921-2016), of the former Blazer Construction Company, previously hanged over the former Webster Parish Courthouse building from 1905 to 1951. Historic Minden Cemetery has graves as far back as 1843 and the American Civil War. Many Minden mayors are interred there. ↑ "2010 Census". quickfacts.census.gov. Retrieved April 27, 2012. ↑ "Post Offices in Webster Parish, Louisiana". ↑ "Camp Minden bunker explosion rocks region". Shreveport Times. Retrieved 2012-10-16. ↑ "Tonnes of explosives found in US town". 3 News NZ. December 4, 2012. ↑ John A. Agan (2014). Lost Minden. Columbia, South Carolina: Arcadia Publishing Company. p. 115. ISBN 978-1-4671-1319-9. Retrieved March 9, 2015. ↑ Edwin Adams Davis (1999). Rivers and Bayous of Louisiana. Gretna, Louisiana: Pelican Publishing Company. ISBN 978-1-4556-1130-0. Retrieved August 24, 2009. ↑ John D. Winters, with John James Kushma of University of Texas at Arlington (1963). The Civil War in Louisiana. LSU Press. p. 164. ISBN 978-0-8071-1725-5. ↑ "Minden, La.". triptrivia.com. Retrieved March 27, 2011. 1 2 3 4 5 6 FBI File 44-1444. ↑ Bill Morrison. "Rockabilly Country News & Views". Retrieved September 27, 2010. ↑ "Fibrebond expansion means 225 new jobs in Louisiana". Business Week. Retrieved February 4, 2014. ↑ "Minden resident Benjamin 'Frank' Griffith, Jr., succumbs". Minden Press-Herald. December 1, 2014. Retrieved January 4, 2015. ↑ "Ben Hunter". The Shreveport Times. November 10, 2015. Retrieved January 5, 2016. ↑ "Jeri Bloxom, NWLTC holds grand opening, September 9, 2013". Minden Press-Herald. Retrieved September 10, 2013. ↑ "Blackburn, William Jasper - Biographical Information". bioguide.congress.gov. Retrieved 22 September 2010. ↑ Press-Herald Staff. "Mary Eloise Martin Bolin". Minden Press-Herald. Retrieved 27 September 2010. ↑ "In memoriam". Louisiana Supreme Court. Retrieved 27 September 2010. ↑ "Parey P. Branton". Shreveport Times. Retrieved September 16, 2011. ↑ "Carey, Harvey Locke". Who Was Who in America, Vol. 9. 1985. p. 63. Retrieved February 24, 2015. ↑ C. W. Barnum. "Webster Parish, Louisiana, History and Genealogy". laahgp.genealogyvillage.com. Retrieved March 11, 2015. ↑ "About Judge Scott Crichton". judgescottcrichton.com. Retrieved August 28, 2013. ↑ "Webster: Mayor City of Minden, October 19, 2013". lasos.blob.core.windows.net. Retrieved October 19, 2013. ↑ "Judge Harmon Drew, Jr". Second Circuit Court of Appeal. lacoa2.org. Retrieved 27 September 2010. ↑ "Drew Family". mindenmemories.org. Retrieved June 5, 2011. ↑ "John C. Fleming homepage". fleming.house.gov. Retrieved 27 September 2010. ↑ "Webster Parish historian John Agan, "Webster Superintendents of Schools"". mindenmemories.org. Retrieved August 21, 2011. ↑ John A. Agan (Webster Parish official historian). "The Impact of the Minden Male Academy". Minden Press-Herald in mindenmemories.org. Retrieved March 24, 2015. ↑ John A. Agan. "Echoes of the Past: Sheriff's Race 1933". Minden Press-Herald. Retrieved September 12, 2014. ↑ "Huckaby, Thomas Jerald". bioguide.congress.gov. Retrieved 27 September 2010. ↑ "Robert Floyd Kennon". sos.luisiana.gov. Retrieved 27 September 2010. ↑ "Webster superintendent of schools: Part II of those who have held the post in the past". Minden Press-Herald. Retrieved November 3, 2014. ↑ "John Killen Home". Minden Memories. Retrieved March 16, 2015. ↑ "Graydon K. Kitchens, Jr., attorney". lawyer.com. Retrieved November 27, 2013. ↑ "W. Burch Lee Funeral Here in Afternoon: Former Clerk of Federal Court Expires After Week of Illness". The Shreveport Times through findagrave.com. Retrieved March 22, 2015. ↑ "Coleman Lindsey". archives. Retrieved July 10, 2009. ↑ "Judge Cecil C. Lowe obituary". Shreveport Times. Retrieved February 27, 2013. ↑ "Charles Marvin". genealogybuff.com. Retrieved November 26, 2013. ↑ "Obituary of Enos Carr McClendon, Jr.". genealogybuff.com. Retrieved June 8, 2012. ↑ "Nikki Henderson, "Mayor of Minden has passed away"". arkaltexhomepage.com. Retrieved June 27, 2013. ↑ "Sandlin, John Nicholas". bioguide.congress.vgov. Retrieved 27 September 2010. ↑ John A. Agan (2010). Echoes of Our Past: The Civil War Years in Minden. p. 37-39. ISBN 978-0-557-56490-3. Retrieved March 14, 2015. ↑ ""Judge John D. Watkins" in Biographical and Historical Memoirs of Northwest Louisiana"". Chicago and Nashville, Tennessee: Southern Publishing Company. 1890. Retrieved March 24, 2015. ↑ "Watkins, John Thomas". bioguide.congress.gov. Retrieved 27 September 2010. 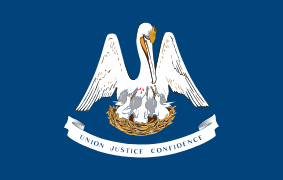 ↑ "Membership of the Louisiana House of Representatives, 1812 - Current: Webster Parish" (PDF). house.louisiana.gov. Retrieved March 11, 2015. ↑ "Membership of the Louisiana State Senate since 1880: Bienville, Bossier, Claiborne, and Webster" (PDF). senate.la.gov. Retrieved March 12, 2015. ↑ Sherrie Norris (July 7, 2012). "Cleone Hodges celebrates 103 years of life". Watagua, North Carolina, Democrat. Retrieved September 15, 2014. ↑ "Capt. Alfred Goodwill". findagrave.com. Retrieved March 12, 2015. ↑ Walter White (1995). A man called White: the autobiography of Walter White. University of Georgia Press. ISBN 978-0-8203-1698-7. Retrieved 27 September 2010. ↑ ""William Green Stewart" in Biographical and Historical Memoirs of Northwest Louisiana". Chicago and Nashville, Tennessee: The Southern Publishing Company. 1890. Retrieved March 14, 2015. ↑ "Tommy Tomlinson". hillbilly-music.com. Retrieved July 1, 2015. ↑ "Wayne Scott Crawford". Baton Rouge Morning Advocate. Retrieved April 17, 2014. ↑ "James Anderson Powell, Sr.". The Shreveport Times. Retrieved April 9, 2016. Wikimedia Commons has media related to Minden, Louisiana.